Material Handling Equipment Installation & Sales. As one of the leading suppliers of industrial equipment in the country, Easy Rack have developed a reputation as experts in managing material handling equipment installation. In order to allow your business to grow, you need access to the latest technology, and also need to be able to draw upon the expertise of companies like Easy Rack to help you to get the most out of all the equipment your business uses. In order to be allowed to function at its maximum efficiency, the modern industrial facility requires a wide variety of different systems to be in place, from storage through to actual production, and the material handling equipment installation for a business requires consideration of the whole business flow to ensure that things are placed in the right place wherever possible to make for a much more efficient facility to be created. Easy Rack are able to bring a full range of material handling equipment installation expertise to your business, to provide everything that you need, from storage area equipment including shelving and pallet racks through to conveyor belts, and everything else besides. 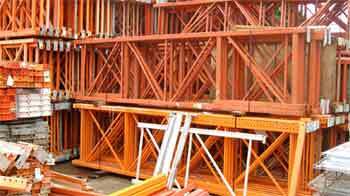 From infrastructure items that are designed to make your building safer such as security gates, and safety railings through to specialist storage shelving designed for particular drums or pallets and other material handling equipment. Installation of complex systems and items must carried out by professional fitters in order to ensure that all of the items work properly, and regular maintenance will ensure that the objects that you purchase offer a long life, and plenty of good service. Reliability is one of the key factors in the efficiency of your business, and with Easy Rack, you are buying equipment that is built to last. Hardwearing, robust, and well made systems that offer your business services that you can rely on mean that you will be able to plan for the long term. Over the past few years, We have developed their business model and systems to help you to grow in the most effective way possible. Focusing a lot of research and development into better methods of material handling equipment installation and creation means that we are now in a position to offer a comprehensive range of cost effective solutions to your business and can supply all of the equipment that you could possibly need in an industrial or other environment. With everything you need for storage, use and disposal in one place, Easy Rack will enable you to carry out material handling equipment installation for your whole business in one place. Easy Rack material handling installation specialists can answer all questions you have about which material handling products work best with your specific operations. Call one of our industrial specialists today at 1-888-776-3720.